Political efforts to end the war in Yemen have suffered a significant blow. On 8 September, planned consultations between the internationally recognised Yemeni government and the Houthis – the Zaidi Shia armed group that took control of Sanaa in September 2014 – collapsed when the Houthis failed to show up, claiming that their opponents had prevented them from attending. There is a risk that this new setback will precipitate dangerous escalation in the conflict. The collapse of the talks is particularly debilitating for UN Envoy Martin Griffiths. Since replacing Mauritanian diplomat Ismail Ould Sheikh Ahmed in February 2018, Griffiths has made careful attempts to draw the Houthis and their opponents, the Saudi-led coalition, back into negotiations. Taking on a more active role than his predecessor, Griffiths spent months engaged in shuttle diplomacy intended to de-escalate the conflict – particularly the fighting on Yemen’s Red Sea coast – and to build trust between the warring parties. As part of this, he repeatedly met with the Houthis in Sanaa, while liaising with Yemeni and Gulf Arab officials in Riyadh and Yemen’s temporary capital, Aden. 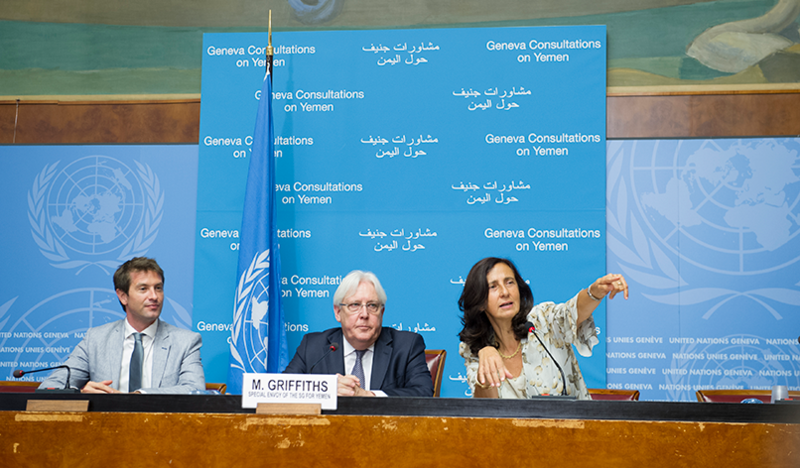 Under Griffiths’ plan, the consultations would have involved a week of discussion on confidence-building measures such as the release of prisoners and the reopening of Sanaa airport. This, he hoped, would allow the sides to take a cautious step towards discussions on more substantive issues. After months of preparations, the talks were supposed to begin in Geneva on 6 September. Although many observers expected little from the negotiations, they were surprised that the Houthis avoided them altogether. Even on 7-8 September, some members of the opposing delegation privately stated their expectations that the Houthis would arrive after delaying as they had in previous rounds of talks. The Houthis demanded transit to the talks via an Omani aircraft so they would be able to transfer their wounded out of the country to a safe destination for treatment – something that the coalition did not allow, instead demanding that they travelled straight to the talks via a UN aircraft. Despite Griffiths’ significant efforts to break the deadlock, the Houthis refused to budge. The Yemeni government has blamed the collapse of the talks entirely on the Houthis, stating that they have demonstrated a lack of interest in peace; other Yemeni observers have criticised the coalition for inflexibility or Griffiths’ team for not paying closer attention to logistics. The political breakdown has already had an impact on the ground. Fighting on the Red Sea coast has intensified once more, following a long pause that, according to Saudi and Emirati military officials, was supposed to provide Griffiths with a chance to begin negotiations. However, by what would have been the second day of the talks (had all gone to plan), Yemeni President Abdo Rabbu Mansour Hadi appeared to call for a military escalation. The coalition’s campaign to capture Hudayda is an especially acute concern, as it threatens to deepen the humanitarian disaster in Yemen. Indeed, one of Griffith’s main achievements had been to delay the offensive on the city by holding out the prospect of new negotiations. Now that the UN process has stalled, it is critical that international actors renew their efforts to protect civilians who could become involved in the unfolding campaign in Hudayda. The fight for the city could lead to huge shifts in Yemen’s power dynamics. It may have significant implications for not only the Houthis but also the various groups that oppose them. For instance, on the war’s western front, the Emirati-backed, Salafi-led Amaliqa Brigade and troops under the command of former president Ali Abdullah Saleh’s nephew, Tareq, have had complicated relations with the Yemeni government – although these complications have been largely side-lined as the fighting has escalated. Against this backdrop, Yemen’s economy is severely deteriorating. As Yemenis rely on imports of goods such as flour, rice, and fuel, the rapid depreciation of the rial has sparked protests in Aden, Mukalla, Saiyun and other southern cities. Public anger about a sharp increase in the cost of living has coincided with the Southern Transitional Council’s call for protests, following its exclusion from the ill-fated consultations. Therefore, international actors should also attempt to address Yemen’s economic crisis, lest weaknesses in the country’s monetary and financial system reignite conflict in Mukalla and other relatively stable places. The scuttling of the consultations could further undermine the economy.